In this class we will concentrate on all colors of the rainbow and channel our inner Andy Warhol. Send us a high-resolution head shot of your pet that has clarity and good lighting and we will hand sketch the image of your pet onto a 12 x 12" stretched canvas for you prior to the class. 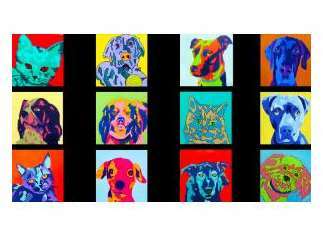 In the class, we will guide you through the process of creating a colorful painted portrait of your pet. This class is aimed at ages 7 and up, plus older siblings, parents and grandparents. All art supplies included. Guests may bring in food or non-alcoholic beverages to enjoy throughout the class. Paint with your child, or leave the studio to let them paint on their own. In that case, parents must leave all contact information at the front desk in case of an emergency. Register on our website to secure your seats.